Comment from discussion Commentary on OITNB S5 E3 "Pissters" from the perspective of a formerly incarcerated person. That line about humanizing prisoners is exactly why I write this series. People commit crimes, they are not defined by their crimes. Thanks so much for the kind words. Now, if I could only inspire people to answer the comment questions (sigh). 5 Things About Season 5 Episode 4 "Litchfield’s Got Talent"
* Finding out that it was Gloria (Selenis Leyva) who conked Daya (Dascha Polanco) over the head and took the gun. Unfortunately for Gloria, the meth-heads depants her in front of the bubble (and in a crowd of inmates) which causes the gun to fall to the floor. In the resulting melee, Angie (Julie Lake) ends up with the gun. * Yoga Jones (Constance Shulman), Sankey, and the Nazi’s take Judy King (Blair Brown) on a tour around the entire facility searching for a way to reach the roof where Judy is planning to get an air dropped care package. I know Yoga Jones really hates Judy, but much of what happens (tying her arms to a board crucifixion style and encouraging her abuse) seem like a stretch for one of Litchfield’s pacifists. * Suzanne (Uzo Aduba), Maureen (Emily Althaus), SoSo (Kimiko Glenn) are joined by Cindy (Adrienne C. Moore), Taystee (Danielle Brooks), and Janae (Vicky Jeudy) as they try to communicate with Poussey (Samira Wiley) from beyond the grave (Seance style). * Red (Kate Mulgrew) and Blanca (Laura Gomez) continue to search for dirt on all of the CO’s but in particular for dirt on Piscatella (Brad William Henke). Red also continues to spiral out of control now that she is dependent on speed. * Sophia (Laverne Cox) is reminded, while working in the infirmary, of how much she misses Sister Jane Ingalls (Beth Fowler) who she believes has been moved to maximum security. Sophia decides to walk out the front door and turn herself in so that she will be transferred to max where she can reconnect with Sister Ingalls. Unfortunately, upon arrival in max, she finds out Sister Ingalls was granted a compassionate release after contracting pneumonia. * Piper (Taylor Schilling) gets increasingly frustrated with Alex’s desire to take responsibility for her part in killing the guard that indirectly resulted in almost all of the drama which has resulted in the riot. I kind of agree with Alex here, there is a strange freedom in accepting that you did something wrong and accepting the punishment. That line came from Cindy in reaction to Taystee & SoSo fighting over who has the most right to grieve Poussey’s death. I guess I didn’t love the seance scene but mostly because it took made Suzanne the “medium” for the seance since she is “crazy.” This placement takes advantage of the long-running Hollywood stereotype that the mentally ill are somehow closer to the spirit realm because they have been “touched” (somehow insanity is about being too sensitive to the spirit plane or something like that). Orange Is the New Black earned credibility by treating it’s prisoner’s like human beings instead of as stereotypes. Uzo Aduba has spent years building Suzanne into one of the most complex, wonderful, and unique characters on television. Why would OITNB risk unraveling that just to move an unimportant plot line (letting SoSo and Taystee “talk” to Poussey) to completion? I find it a lazy, counterproductive, and questionable choice to put Suzanne (and Maureen) in charge of channeling the spirits. If you are wondering about the “debate” between Suzanne, SoSo, and Maureen about the difference between Ghosts and Spirits, I am pretty sure Suzanne is saying that “Spirits” can choose to visit our human plane while “Ghosts” are trapped here by unresolved guilt. For the record, Suzanne feels Spirits exist while Ghosts do not. One reader mentioned after Sunday’s post that I had not taken a stand on Suzanne’s role in Bayley’s death. For the record, I publically wrote a response to the idea that Suzanne was responsible for Poussey’s death several weeks ago. I do not think Poussey’s death was Suzanne’s fault although she was certainly complicated Bayley’s decision-making. Blanca says this in reference to the files that she and Red are reading in Caputo's office while trying to find dirt on Piscatella. 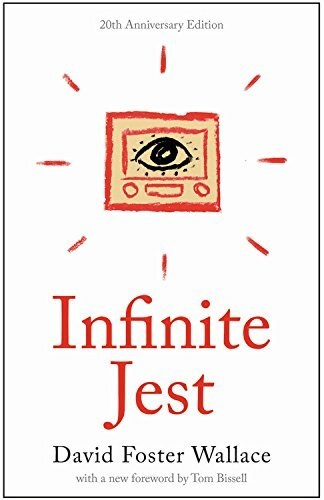 In case you don’t get the reference, Infinite Jest was the first full-length novel (and I do mean full-length - Blanca is not wrong here) by the late David Foster Wallace who is a writer I truly loved (RIP) and who I have written about before (in the context of the USA Network show Mr. Robot). That is two weeks in a row where Blanca had one of the best jokes (The Heat Miser joke from E3 still makes me giggle - Red does look exactly like Heat Miser). I do like the dialog when Red starts talking about how she, “feels 27” and then looks in the mirror. My Mom has told me that she feels exactly that way herself (she is in her 70’s) and I myself often feel that way. I am still listening to as much new music now as I was when I was 18, I still love most of the same things, but when I look in the mirror...I don’t look, at all, like I feel. A friend at church grew up in Japan and she told me that in Japan aging people are not culturally isolated or neglected like they often are in the United States (relegated to shuffleboard, golf, and a walker). Maybe we should be more like Japan? I have no idea if this is accurate, and it is anecdotal, but I would certainly be willing to learn more. Anyway, Red finally discovers that Piscatella was on duty when an inmate died in the showers at max (he was discovered burned over 80% of his body). That line was uttered by Angie and Leanne and directed at the Latina’s after they recover the gun. Obviously, they meant to say “I am the Jefe” but as they are meth-heads apparently it is thought to be entertaining when they often purposely deploy racist comments (it’s funny because the meth-heads are stupid...see). This was not the only example of the meth-heads being used as the vehicle for “stupid/racist” comments either (You can be “the Hispanic”). Either way, I don’t really like this kind of stereotyping. Many uneducated people are not racist. Many meth-heads are not racists. One of the guys who lived across the hall from me for the last few years was a very nice non-racist, uneducated, but smart and capable recovering meth-head (unfortunately, I suspect he is either on the run or back in prison now). * And despite all the wars and bombings and, of course, having the largest prison population and harshest sentences in the world, what many think we all suffer from is the so-called “wussification” of America. There are people in prison who are very racist, but something about this deployment of humor seems gross and really rubs me the wrong way. Again, I find it troubling that they are reducing what had been complex characters (yes, even Angie and Leanne) to cartoonish stereotypes. So, seriously, Sophia wants to reconnect with Sister Ingalls so badly that she volunteers herself as an escapee to go to max (only to find out Sister Ingalls got pneumonia and was given compassionate release)? By the way, escape is a new charge. I am really confused, everyone else at Litchfield seems to have full internet access (at least from cell towers) and Sophia didn’t even think to look up if Sister Ingalls was still an inmate? I hope I am wrong, but Sophia is one of the best characters on OITNB and I feel like lately the writer’s have been going out of their way to erase her from the series (she just got out of SHU for a full season as you might recall). Just when she found a productive role for herself as a riot nurse the writer’s move her to maximum security? Why can’t she just be written into the main storylines? On the bright side, now she can hang out with Miss Claudette (and Laverne Cox is also a regular on the show Doubt which is getting a second look this summer. On the bad side, it is a show on CBS which means it is probably bad - sign - but, hope she does well!). The governor’s “assistant” informs his Chief of Staff that he might be out of it after taking an Ambien as she shows up to inform him about the riot. Look, I have NO IDEA why a prison riot at a Federal Facility (managed by a private prison company) would fall under State Jurisdiction (Federal Inmates fall under Federal Jurisdiction). I could see how the Federal Government might ask for help from a State Government, but it would likely be in a support role. Anyway, let’s accept the premise and roll with it (I could certainly be wrong, I asked Heather Anne Thompson (whose Pulitzer Prize-winning "Blood in the Water" was about Attica's prison riot) but she said she was still gathering her thoughts about the riot and would get back to me). So, Even if the Governor did not know that a CO had been shot, he would certainly know that a large number of CO”s were being held hostage. There is no way in the world that a Governor could afford to take such a Laissez Faire attitude towards a riot. My biggest problem with the season so far is the lack of quick official response. This just lacks credibility IMHO. "Who is your least favorite Season 5 Character So Far (and Why)?" Today's book is David Foster Wallace's book "Infinite Jest." Sign up with your email address and never miss an Orange, Black, or Bleak.